What's big and bold and can hold 10 strips steaks with room to spare? It's the Weber Q 2200 Portable Gas BBQ. Get legendary Weber quality with convenient portability in this gas grill that offers powerful cooking capability in a small and modest package. Some assembly required. The Napoleon TravelQ TQ285 Portable Gas Grill has set a new standard in portable grilling excellence. Dont let the small size fool you; this grill boasts 285 square inches of total grilling area. That means you can grill up to 18 large hamburgers at once. Be the star of your next tailgate with this bad boy. Two, individually controlled burners provide up to 12,000 BTUs of flame power. That means you can have perfectly powerful grilling anywhere you go. Featuring 363 square inches of cooking space, the Weber Original Kettle consists of a heavy gauge porcelain-enameled lid and bowl for durability and long grill life. The grill also features a factory assembled, stainless steel One-Touch cleaning system, a hinged cooking grate and a removable high-capacity ash catcher to make indirect grilling easier. The grill's built-in lid thermometer allows you to monitor your unit's temperature, and the bowl handle includes an integrated tool hook for easy and convenient storage. Plus, the lid handle features a heat shield for comfort and the grill's legs have a spring clip/push pin system for easy assembly. 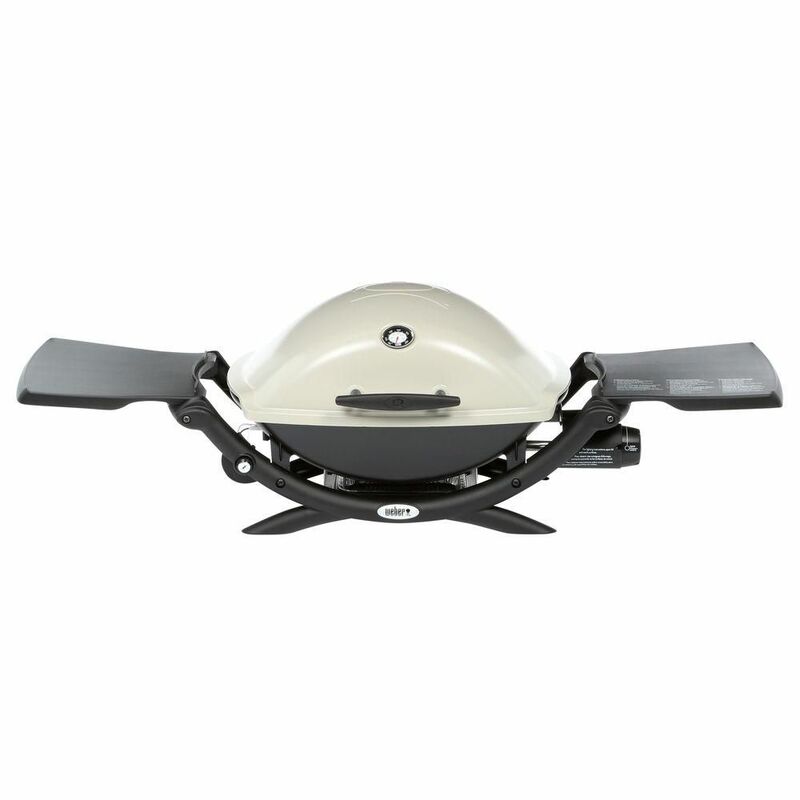 The Q 1200 Gas Grill LP has the same great performance and sleek styling of other models in the Q series, but adds new aesthetics that are both functional and fun, including a larger grip handle and control knobs, ergonomic side handles, a sturdy front and rear cradles, and the familiar Weber Q logo prominently branded in the lid. Q 2200 Portable Gas BBQ What's big and bold and can hold 10 strips steaks with room to spare? It's the Weber Q 2200 Portable Gas BBQ. Get legendary Weber quality with convenient portability in this gas grill that offers powerful cooking capability in a small and modest package. Some assembly required. Q 2200 Portable Gas BBQ is rated 4.7 out of 5 by 436. Rated 5 out of 5 by Jack from Excellent grill. It's easy to use. It heats up quickly, doesn't use too much propane and is no... Excellent grill. It's easy to use. It heats up quickly, doesn't use too much propane and is not difficult to control. I like it! Rated 4 out of 5 by JP from Very please, but was expensive in my opinion. It's not to heavy, cooks evenly, easy to clean. Very please, but was expensive in my opinion. It's not to heavy, cooks evenly, easy to clean. Rated 5 out of 5 by Adelaide#1 from Quality Product We bought this about 6 months ago and are totally satisfied with the product. It is everything we expected. We have it connected to a 20 lb. propane tank rather than using the small canisters. Would highly recommend Weber grills. Rated 4 out of 5 by Burr41 from Always easy to go Spring has finally arrived. After sitting all winter started right up and cooked my steak to perfection. Thanks Weber! Rated 4 out of 5 by Dands from Bigger is not necessary better Good experience with this Weber Q2200 gas grill after 1 year. The long lasting and durability of this unit will be the question in the future. To this point a very satisfied customer. Rated 5 out of 5 by Graham R from Fabulous grill My wife and I are full time RVers, so we use our Weber Q 2200 all the time. Got it a year ago when we started travelling, and I passed on my old smaller Weber Q grill to my daughter & son-in-law. It cooks evenly and never lets us down! The Q Adapter Hose (6501) is needed to connect to a Type 1 (791) cylinder connection on a 20 lb. LP tank. Hose with adapter fittings for connecting LP tanks to equipment. Adapter allows for quick and easy hook up. Type-1 tank connection. Long-lasting 100% solid brass fittings offer superior durability. Provides secure, airtight connection between grill or fire pit and tank. Perfect for lanterns, camp stoves, tabletop grills, and more. Great for camping, tailgating, heating needs or having an outdoor cookout. Propane appliance hose connect an appliance designed for 1lb disposable cylinder to a 20lb or 30lb refillable propane tank. Can this be attached to the Weber travel cart? Where can I get a replacement burner for the Weber Q 2200?